UPDATE RELEASE v1.3 - 3rd March 2018. Full details in the Release Post. The Mussurana is by far the prettiest of Aegidian's early OXP ships, so I hope it makes a nice seasonal present to you all. 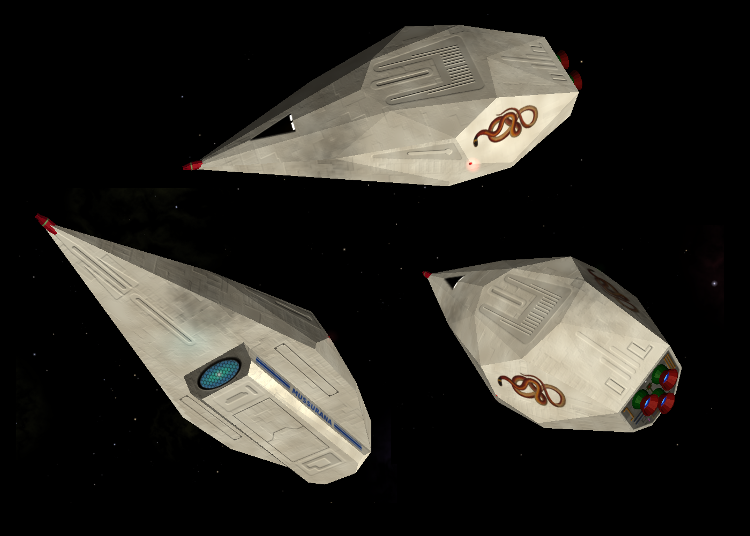 Staying true to the original, the specifications are more or less un-changed except for a few tweaks here and there to bring the ship up to date for Oolite v1.80 and above. All plists are now in openStep and the new 'roles' have been incorporated by defining three NPC versions, a hunter, a trader and a pirate. They all have slightly different specs based on their roles, the pre-existing information from the wiki page for this ship and with the original OXP code specs. There is also a 'player' version. The paint job is inspired by the original design, and the Hi-res graphics are to the same standard as the other Classic Ships OXPs. This expansion forms part of The Classic Ships suite of OXPs, but is fully self-contained and can be installed by anyone - there are no dependancies on or requirement for any other 'Classic Ship' expansions to be installed. Working with these old, original models and textures has certainly been a challenge at times, and this one needed more work than most. The original model was not centred well and was 'inside out', so I started by centering it and flipping the normals. Then I made a new UV map. I have had to make new UV maps for several of the previous ships as it was not possible to achieve the level of detailing I wanted using the old diffuse_maps as templates. And this beauty was no exception. But with the model sorted and a solid starting point for the new texture materials it was relatively straight-forward. And I think totally worth the effort. This will be the last of the current tranche of Classic Ships, as I have a couple of other projects to finish next, but I hope to return to these Golden Oldies in the future with Murgh's Old Ships. The Classic Mussurana OXZ is available via the in-game Expansions Manager, or from here. Last edited by Smivs on Sat Mar 03, 2018 8:52 pm, edited 3 times in total. I hope you are having a good holiday, thank you for the present. Unfortunately I've just had to upload v1.1 as I left a dodgy shipyard.plist in v1.0 - a tweaked one to make lots available for buying. This has now been put right, so apologies to all of you who have already downloaded. No great hurry to update as the only problem will be far too many available in the shipyards - everything else should be OK.
UPDATE RELEASE v1.2 - 16th March 2017.
v1.2 is now available via the Manager. This is a minor update. shiplibrary.plist fixed (so ship now appears in the Library display). Improved graphics (Improvements to the normal-mapping). The wiki has been updated, and the image in post #1 has been replaced with one of the current ship. v1.3 is now available via the Manager. This is a minor update to correct a shipdata.plist error causing issues with 'roles'. I like it Any update for other versions (like pirate) planed as well ? I'm glad you like the plating effect - the whole 'Classic Ships' suite has this. It took a long time to perfect it but was well worth the effort. One day I may get round to doing a 'how-to' for it. While I highly respect Aegidian's work I do believe an upgrade once in a while is an improvement for Oolite. Thanks to Griff (and more advanced systems available) even the core-ships nowadays look a lot better than in the past.